For the song by Foals, see Spanish Sahara (song). Dark grey: Other Spanish possessions. At the Berlin Conference (1884-5), the European powers were establishing the rules for setting up zones of influence or protection in Africa, and Spain declared 'a protectorate of the African coast' from Cape Blanc to Cape Bojador on 26 December 1884. It officially informed the other powers in writing on 14 January 1885. It began establishing trading posts and a military presence. In July 1885, King Alfonso XII appointed Emilio Bonelli commissioner of the Río de Oro with civil and military authority. On 6 April 1887, the area was incorporated into the Captaincy General of the Canary Islands for military purposes. In the summer of 1886, under the sponsorship of the Spanish Society of Commercial Geography (Sociedad Española de Geografía Comercial), Julio Cervera Baviera, Felipe Rizzo (1823–1908) and Francisco Quiroga (1853–1894) traversed the territory, which was called Río de Oro, and made topographical and astronomical observations. At the time, geographers had not mapped the territory and its features were not widely known. Their trek is considered the first scientific expedition in that part of the Sahara. On entering the territory in 1884, Spanish forces were immediately challenged by stiff resistance from the indigenous Sahrawi tribes, Saharan Arabs who lived in many oases and coastal villages. The indigenous people worked mainly in fishing and camel herding, and speak the Hassaniya language, a Bedouin Arabic dialect. A rebellion in 1904 was led by the powerful Smara-based marabout, Shaykh Ma al-'Aynayn, was put down by France in 1910, which ruled neighbouring Algeria. This was followed by a wave of uprisings under Ma al-Aynayn's sons, grandsons and other political leaders. There is some dispute and ambiguity about whether the territory was under Moroccan royal sovereignty at the time when the Spanish claimed it in 1884. In 1886, Spain signed the Treaty of Idjil, by which the Emirate of Adrar ceded the land of the colony to Spain. This treaty was of no legal value, since the Emir had no claim to the territory, but since Morocco had no claim either (at least since the Hispano-Moroccan Treaty of 1767), the Spanish 'invented' a claim which the Emir could, with no harm to himself, immediately cede. The borders of the territory were not clearly defined until treaties between Spain and France in the early 20th century. Spanish Sahara was created from the Spanish territories of Río de Oro and Saguia el-Hamra in 1924. It was not part of the areas known as Spanish Morocco and was administered separately. Spanish and French protectorates in Morocco and Spanish Sahara, 1912. Given such tribal uprisings, Spain found it difficult to control parts of the territory's large hinterland until 1934. After gaining independence in 1956, Morocco laid claim to Spanish Sahara as part of its historic pre-colonial territory. In 1957, the Moroccan Army of Liberation nearly occupied the small territory of Ifni, north of Spanish Sahara, during the Ifni War. The Spanish sent a regiment of paratroopers from the nearby Canary Islands and repelled the attacks. With the assistance of the French, Spain soon re-established control in the area through Operaciones Teide-Ecoubillon. It tried to suppress resistance politically. It forced some of the previously nomadic inhabitants of Spanish Sahara to settle in certain areas, and the rate of urbanisation was increased. In 1958, Spain united the territories of Saguia el Hamra and Río de Oro to form the overseas province of Spanish Sahara, while ceding the province of the Cape Juby Strip (which included Villa Bens) in the same year to Morocco. 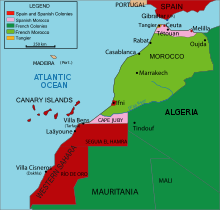 In the 1960s, Morocco continued to claim Spanish Sahara. It gained agreement by the United Nations to add the territory to the list of territories to be decolonised. In 1969, Spain returned Ifni to Morocco, but continued to retain Spanish Sahara. In 1967, Spanish rule was challenged by the Harakat Tahrir, a protest movement secretly organised by the Royal Moroccan Government. Spain suppressed the 1970 Zemla Intifada. In 1973, the Polisario Front was formed in a revival of militant Sahrawi nationalism. The Front's guerrilla army grew rapidly, and Spain lost effective control over most of the territory by early 1975. Its effort to found a political rival, the Partido de Unión Nacional Saharaui (PUNS), met with little success. Spain proceeded to co-opt tribal leaders by setting up the Djema'a, a political institution loosely based on traditional Sahrawi tribal leaders. The Djema'a members were hand-picked by the authorities, but given privileges in return for rubber-stamping Madrid's decisions. In the winter of 1975, just before the death of its long-time leader Generalissimo Francisco Franco, Spain was confronted with an intensive campaign of territorial demands from Morocco and, to a lesser extent, from Mauritania. These culminated in the Marcha Verde ('Green March'). After negotiating the Madrid Accords with Morocco and Mauritania, Spain withdrew its forces and settlers from the territory. Morocco and Mauritania took control of the region. Mauritania later surrendered its claim after fighting an unsuccessful war against the Polisario Front. Morocco began fought the Polisario Front, and after sixteen years, the UN negotiated a cease-fire in 1991. Today, the sovereignty of the territory remains in dispute. 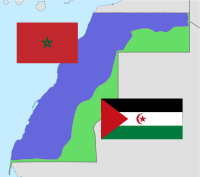 Morocco has resisted allowing a referendum to be held, and has continued to offer its people jobs in controlled territory. The United Nations considers the former Spanish Sahara a non-self-governing territory, with Spain as the former administrative power and, since the 1970s, Morocco as the current administrative power. UN peace efforts have been directed at holding a referendum on independence among the Sahrawi population, but this has not yet taken place. The African Union (AU) and more than 80 governments consider the territory to be the sovereign (albeit occupied) state of the Sahrawi Arab Democratic Republic (SADR), with a government-in-exile backed by the Polisario Front. ^ a b c Robert Rézette, The Western Sahara and the Frontiers of Morocco (Paris: Nouvelles Éditions Latines, 1975), p. 60. ^ "Encuentro con Premiados SGE 2007". Sociedad Geográfica Española. Archived from the original on 29 September 2011. This page was last edited on 17 April 2019, at 19:27 (UTC).